Meaning: tat--that knowledge of different sacrifices; viddhi--try to understand; pranipatena--by approaching a spiritual master; pariprasnena--by submissive inquiries; sevaya--by the rendering of service; upadeksyanti--initiate; te--unto you; jnanam--knowledge; jnaninah--the self-realized; tattva--truth; darsinah--the seers. The path of spiritual realization is undoubtedly difficult. The Lord therefore advises us to approach a bona fide spiritual master in the line of disciplic succession from the Lord Himself. No one can be a bona fide spiritual master without following this principle of disciplic succession. The Lord is the original spiritual master, and a person in the disciplic succession can convey the message of the Lord as it is to his disciple. No one can be spiritually realized by manufacturing his own process, as is the fashion of the foolish pretenders. The Bhagavatam says: dharmam tu saksad bhagavat-pranitam--the path of religion is directly enunciated by the Lord. Therefore, mental speculation or dry arguments cannot help one progress in spiritual life. One has to approach a bona fide spiritual master to receive the knowledge. Such a spiritual master should be accepted in full surrender, and one should serve the spiritual master like a menial servant, without false prestige. Satisfaction of the self-realized spiritual master is the secret of advancement in spiritual life. Inquiries and submission constitute the proper combination for spiritual understanding. Unless there is submission and service, inquiries from the learned spiritual master will not be effective. One must be able to pass the test of the spiritual master, and when he sees the genuine desire of the disciple, he automatically blesses the disciple with genuine spiritual understanding. In this verse, both blind following and absurd inquiries are condemned. One should not only hear submissively from the spiritual master, but one must also get a clear understanding from him, in submission and service and inquiries. A bona fide spiritual master is by nature very kind toward the disciple. Therefore when the student is submissive and is always ready to render service, the reciprocation of knowledge and inquiries becomes perfect. In Bhagavat Gita, Krishna teaches us that we have to go to gnanis and learn a lot from them. One should not think he knows a lot. To teach us of this, Sri Rama goes from ashrama to ashrama visiting sages. Agastya, is derived by a forced etymology from a fable, which represents him as having commanded the Vindhya mountains to prostrate themselves before him, through which they lost their primeval altitude; or rather, perhaps, the fable has been invented to account for his name. This miracle has obtained for him the epithet Vindhyakuta; and he acquired another name, Pitabdhi, or Samudrachuluka, "Ocean drinker,' from another fable, according to which he drank up the ocean because it had offended him, and because he wished to help the gods in their wars with the Daityas when the latter had hidden themselves in the waters. Indra defeated Vritra with the help of Kalakeyas. The troublesome Kalakeyas went and hid in the ocean. Then Agastya drank the ocean after which the kalakeyas could be killed. He was born as Urvashi, hence he is also known as Ouvasheyar. He was born of Mitra-Varunas in a Kumba (vessel). Kumba-sambavar is his other name. Once he carried the palanquin for Indra. Nahusha did great penance and earned the title of Indra. he wanted to sit next to Indrani and went fast. He went in a palanquin and asked sapta-rishis to carry his palanquin. They did. He also made Agastya to carry his palanquin. But since Agastya was short, he walked slow. 'Sarpa', 'sarpa' (faster) came the order from Nahusha. Finally angered by his words, Agastya cursed Nahusha to be born a serpent. When he asked about his redemption, he said when pandavas came for vanavas, that Yudhisthira would touch the serpent body of Nahusha and that his redemption would come by that time. Like this, Sage Agastya is famous for many stories. His wife is Lopamudra who flew out of Agastya's kamandalu and flows as river Kauveri. As part of Sri Ramanin Padhayil, we have started from Agastya ashram in MP. As on today, we have completed 10 days of our Yatra. Many of us were happy that a major part of the trip was completed. The difficult section of the yatra is over. But there is one more important place. In MP, we started from Satna and we need to cross Jabalpur and travel south. Need to cross the entire MP. It was 9 PM when we started. In the morning, we had to be in the place called Ramtek. Need to cross the MP border and get into Maharastra. Crossing state border needs permit and it takes time too. We had to cross the huge line in the check post where permit check will be done. All were asleep. Around 2.30 PM the vehicles stopped for the border checking. In 2006, we didn't understand the route so we didn't go to Narmada. Valmiki Ramayanam does not talk about Ram crossing Narmada river. Ram might have come in the eastern side of Narmada and it was not clear. So in 2006 we did not go to Narmada river. But in 2010, when we were waiting for the clearance at 2.30 PM, we enquired whether Narmada flows near by. He told us that 70 KM from here on the western side you can see Narmada. It was not part of our plan. If we have to change the plan, we need to communicate to all the 15 drivers. Language was also a problem to communicate to all the drivers. But we managed to communicate since we didn't want to miss Narmada when we have had bath in Yamuna, Ganga, Sarayu, Gandaki and many rivers. Morning 4.15 am we had a lovely river bath. Everyone were surprised and happy to have a bath in the river Narmada who was flowing pure. All of us had a bath and got ready and started from that place at 5.30 am. Then we started from there to get into Maharastra. In 2006, we had to change the buses when we crossed the border. It was a great challenge. Next time in 2010, we covered the entire 8000 KM in a single bus till Srirangam. We started from that place to reach a beautiful place called Ramtek. Has Lord Rama come here to Ramtek? 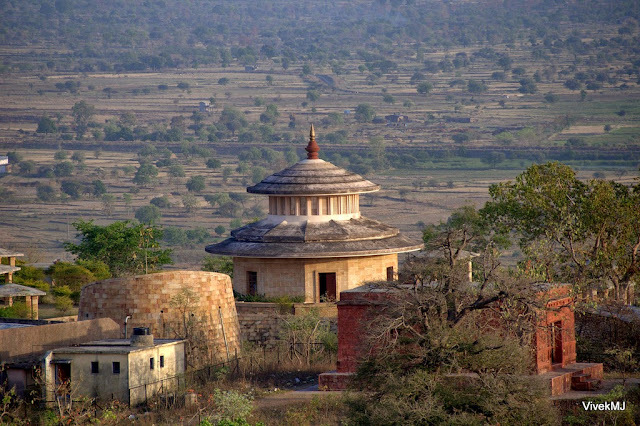 Also there is one Agastya Ashram in Ramtek too. Why have we come to Ramtek? When we look into epic Valmiki Ramayana, this place is not told. Also from Agastya Ashram if Ram travels west he can reach Nashik, Panchavati. Then why Ramtek, which is in south-west direction. Valmiki Ramayan does not explain about Lord Rama coming here to this place during this sargam. However, it appears in the Valmiki Ramayana, Book 7, the 'Uttarakanda' [Final Chapter], sargas 73-76, in the Adhyatma Ramayana version of Ramayana. As Sri Rama was conversing with the sages in his court, a brahmin arrived there with the corpse of his son and wailed O son! Your death is certainly due to some flaw of Sri Rama. Now, your mother and I have decided to give up our lives as there is no point in living. Sri Rama's heart was filled with grief and he asked Sage Vashishtha as to how the brahmin could be helped. Sage Vashishtha revealed to Sri Rama that the brahmin's son had died a premature death because of Shambuk. Vashishtha said -"Shambuk is a Shudra by birth, but he is doing an austere penance. Shudras are not entitled to do penance in all the three yugas, except the Kali Yuga. So, only his death can bring back the brahmin's son alive". Sri Rama instructed both his younger brothers - Lakshmana and Bharata, to look after the state's affairs in his absence and went in search of Shambuk boarded on his Pushpak Vimana. Sri Rama saw a man doing penance at the shore of a reservoir. He landed his Pushpak Vimana and went near that man. He introduced himself and enquired about the man's identity. Sri Rama asked - Why are you doing such an austere penance. Who are you? Without moving the man replied that he was a shudra named Shambuk. He said - I am performing this rigorous penance in order to Conquer the heavens with this body. Sri Rama took out his sword and severed Shambuk's head. Lord Rama killed him due to his bad intentions and there by giving Shambuka his Moksha. All the deities hailed Sri Rama and the brahmin's child became alive once again. According to this version, Shambuka, a shudra ascetic, was slain by Rama for attempting to perform penance in violation of dharma, the bad karma resulting from which caused the death of a Brahmana's son. It is believed that Shambuka was beheaded in a hill at Ramtek, near Nagpur in Maharashtra. Meaning: My sweet Lord Rama went and slew Sambuka of terrible penance, gave life to the dead Vedic seer and wore the jeweled garland given by Sag Agastya. He sent his brother Shatrughna to slay the Asura Lavana. By the curse of Durvasa, he parted from his valiant brother Lakshmana. He resides in Tillainagar Tiruchitrakutam. We remember him always in our hearts, are we not saved from all harm? 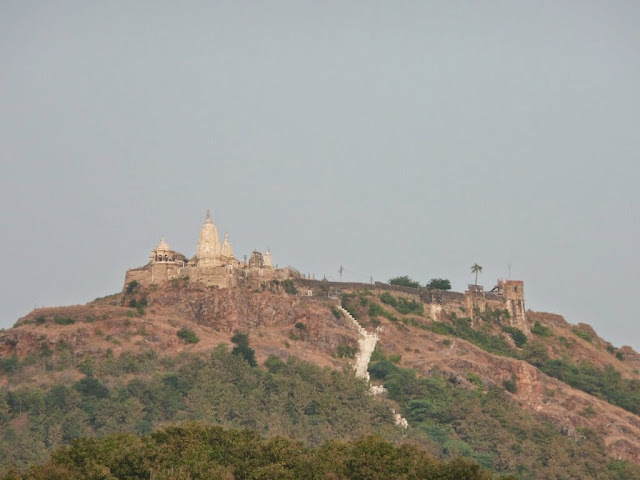 This place, situated on a hill ,is about 60 kms from Nagpur Railway station. 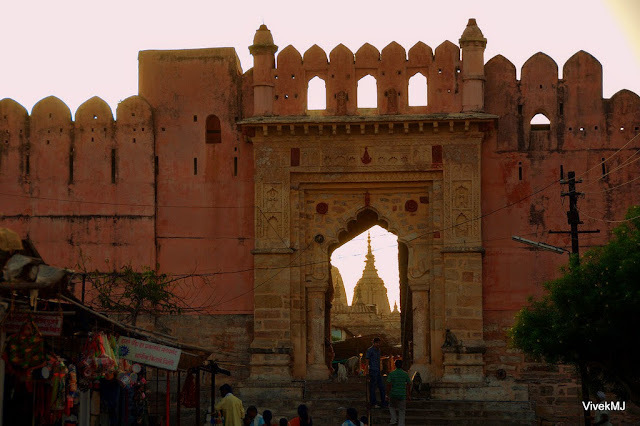 Opposite to station, there are many travel operators who will take you to Ramtek. One can finish visiting this temple from Nagpur within 4 hours. “TEK” means oath. As Sri Rama took an oath in the presence of rishis at Agastya muni ashram to protect them and annihilate the rakshasa race, this place came to be known as “Ram-tek”. This is one of the ashrams of Agastya muni. There is an ashram of Agastya muni near Satna (which we have covered in our previous articles) about 4 hours journey from Satna. To visit this place one has to stay at Satna or Chitrakoot for an extra day. There is evidence that Agastya muni stayed at Ramtek. In Uttarkandam, it is mentioned that Sri Rama killed Sambarasuran at this place. He paid respects to Agastya muni who was staying here. right, then Lakshmana sannidhi. Behind Lakhsmana’s sannidhi, is the sannidhi for Sita-Ramar. Agastya muni blessed and rewarded Lakshmanan for all the kainkaryams he was doing to Sri Rama, that he would give darshan prior to Sri Rama. Usually, Lakshmana is always seen by the side of Rama. Only in this temple, there is a separate sannidhi for Lakshmana whom should be worshipped first. In the main sannidhi, there are vigrahams of Sita-Ramar. 15 days utsavam is celebrated during Chaithra maasam(April) culminating with Sri Rama Navami. 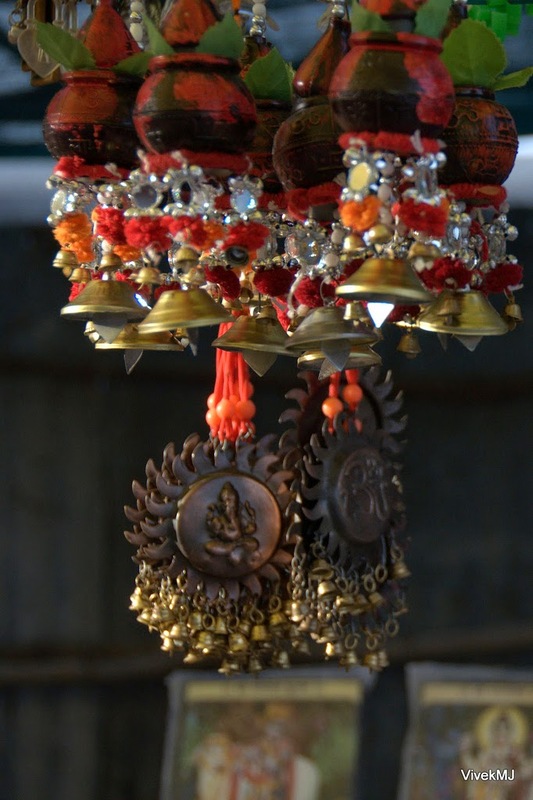 Starting from Ashwini Pournami (pournami after Dassera ) upto Kartika Pournami, special puja takes place in the evenings and on th last day i.e. Kartik Pournami also known as “Tipini Purnima”, the old dresses worn by Perumal earlier are kept in a vessel and dipped in ghee. The vessel is then taken to the hilltop and lit fire. 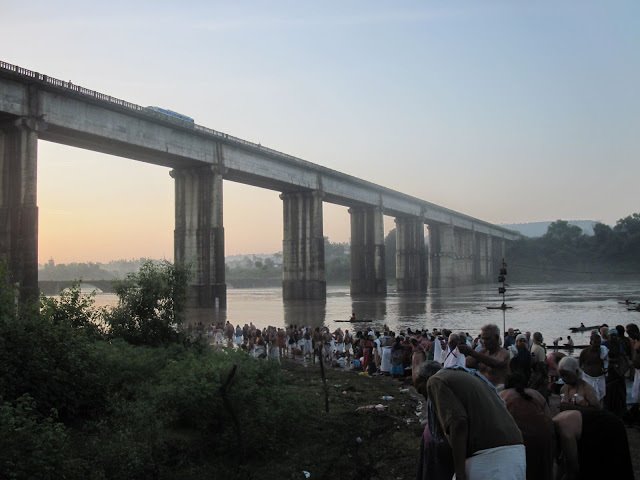 Thousands assemble to witness the jyothi. As the asura, Tipini was killed by Shiva on this day, it is celebrated as “Tipini Purnima”. 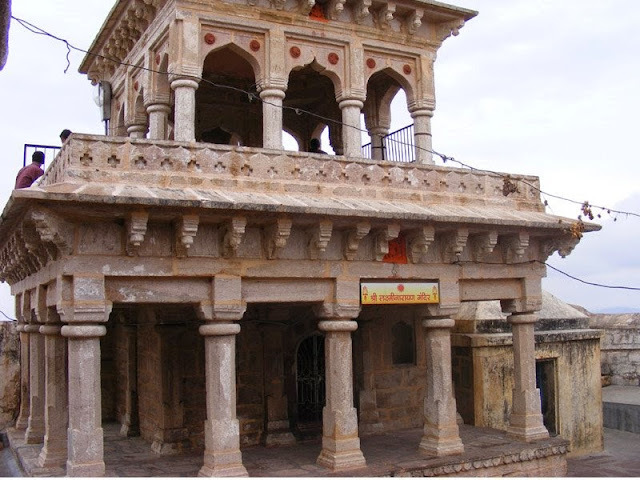 A look up on wikipedia gives the following facts, Ramtek has got Historic temple of lord Rama. 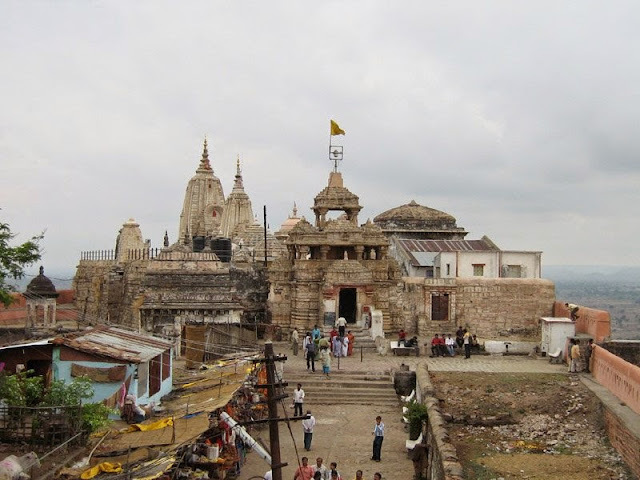 It is believed that Ramtek was the place where Rama, the Hindu god, rested while he was in exile. 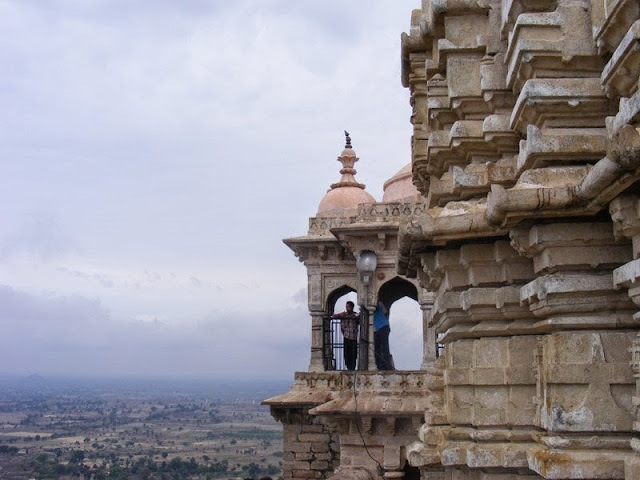 Legend has it that the aashram of great Hindu sage Agastya was situated close to Ramtek. While the sages performed religious rites, the demons used to disrupt their activities and slayed a great number of holy men. Lord Rama was distressed to hear about this, and took a vow to relieve the world from the demons. 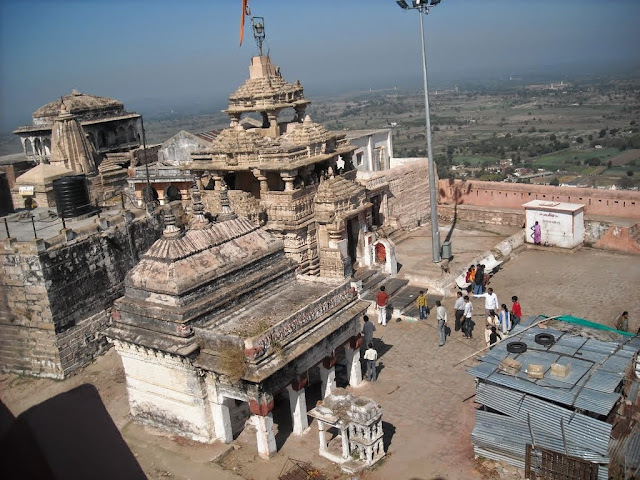 'Tek' means vow in local language, hence the word Ramtek comes from 'Vow of Ram'. 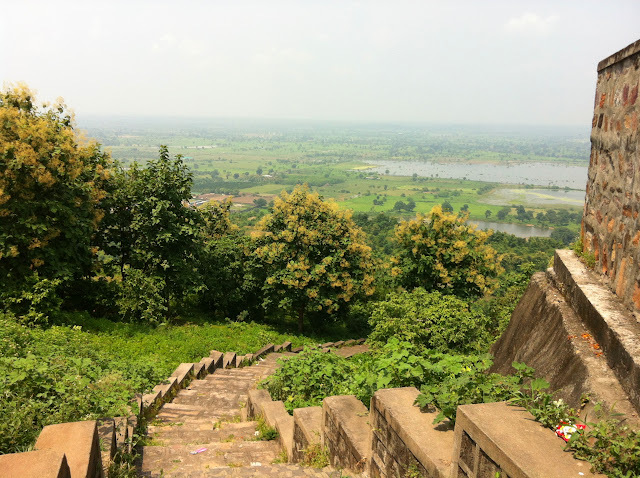 Thus it is believed locally that whoever takes a vow at Ramtek is blessed by the gods for its fulfillment. 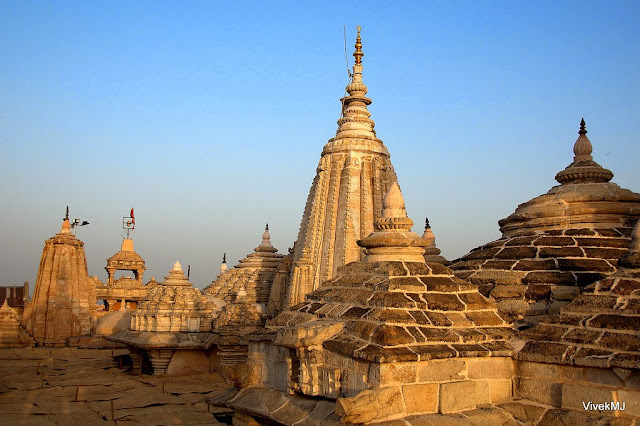 The 'padukas' of Lord Ram are believed to have been worshipped here for centuries The present temple is believed to have been built by the King of Nagpur Raghuji Bhonsale,after his victory over fort of Deogarh in Chindwara. This place is also famous for its relation with Great poet Kalidasa. 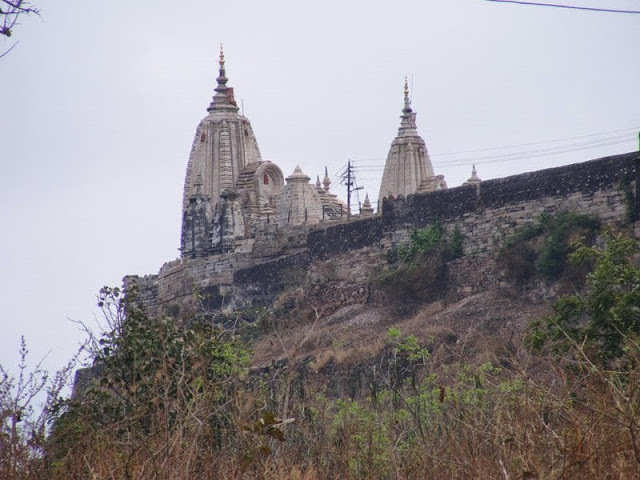 Kalidasa has written Meghdootum in hills of Ramtek The place is more popular for Kalidasa writing Meghdooth here and there is a Kalidasa smarak built here. Next we planned to visit 'Koundinyapur' on the way to Nashik, which is Sri Krishna's wife Rukmini's birthplace since it is on the way. Kingdom of Vidharba - Kundinapuram is where Rukmini's marriage took place. But due to time constrain, we couldn't make it. 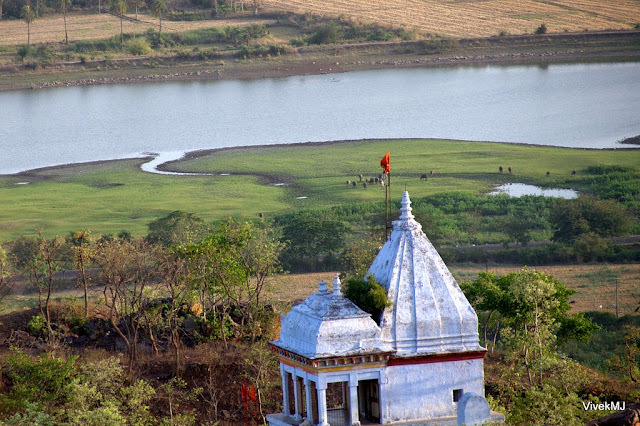 Nashik is on one side of river Godavari, the other side is Panchavati. The jatayu-moksha sthala and janasthana are located near Nasik-Panchavati. Nasik means the nose and ears that was cut out (by Lakshmana). (Nasika means nose). The nose that was cut out by Lakshmana (in Panchavati), flew past the Godavari and fell down in Nasik. The Surpanaka episode, Sita's abduction, the commencement of RAma's search for Sita, Jatayu moksha all happened in Nasik-Panchavati. Let us explore this place next!